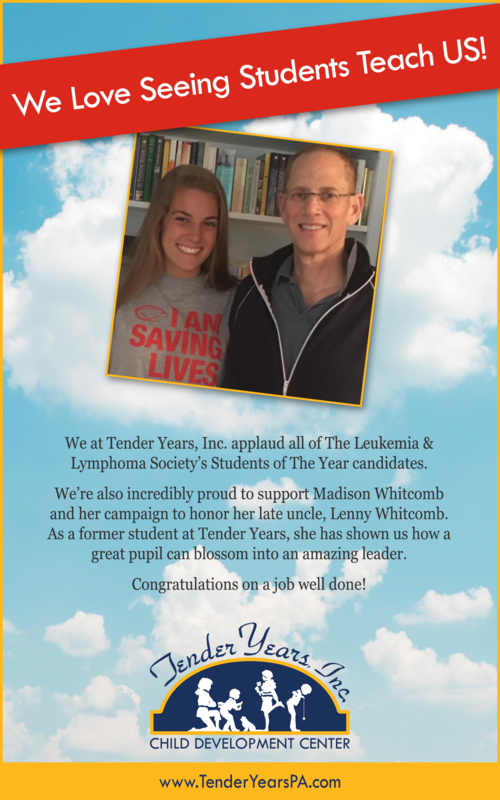 We at Tender Years are supporting Madison Whitcomb and her “Students of The Year” campaign for The Leukemia & Lymphoma Society. And we hope YOU will too! We are incredibly proud to support Madison Whitcomb and her campaign to honor her late uncle, Lenny Whitcomb. As a former student at Tender Years, she has shown us how a great pupil can blossom into an amazing leader! Madison is aiming to raise $50,000 in donations in order to fund a research grant in the name of her uncle, Lenny. And she needs YOUR help! YOUR donation could be the one that gets Madison to her $50,000 goal! ALL donations must be made by this Thursday, March 8!! !